Dana Point has 22 very important people that serve our community every day as a part of the Volunteers In Police Services program, more commonly referred to as our local VIPS. The work done by these individuals helps save the City of Dana Point money each year in Police Services. Members of van patrol can be seen around the City in a marked VIPS vehicle as they serve as an extra set of eyes and ears for our Police Services. They look for suspicious activities, roadway hazards, routinely check local parks and events, make daily checks of residents’ homes during vacation. 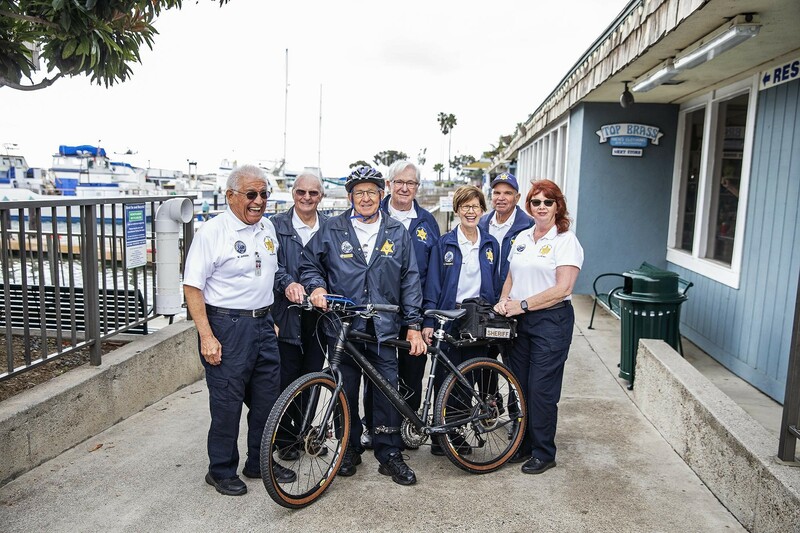 The Bicycle Patrol functions much like the Van Patrol but focuses primarily on the beach areas and the Dana Point Harbor Area. Our pedaling VIPS work in teams of two, looking for anything suspicious and issuing citations to illegally parked vehicles. As for the Clerical Support team, they provide invaluable assistance to Police Services and other departments within the City to compile a variety of statistical reports and information updates. These documents assist our patrol deputies, allowing them to keep up to date on crime patterns and problem areas. We also have one of the best Neighborhood Watch programs in the region filled with over 180 Block Captains that represent each community within Dana Point. The communities host quarterly meetings to help keep the Block Captains informed about activities occurring in each neighborhood. The Block Captains, in turn, advise the residents in their area. This team also publishes a community crime prevention publication, Dana Point Watch, in addition to offering free home inspections and individual Neighborhood Watch presentations. Each one of the above provides a separate, but very important service to Dana Point. In addition to the four areas, the VIPS help out at every special event in town with traffic and crowd control. Without their assistance at special events, Police Services would incur significantly higher overtime expenditures for these events. To learn more about Dana Point’s VIPS visit our site here. The City also encourages residents and businesses to do their part by reporting litter, debris, or abandoned property around town by downloading our ‘Report 2 DP’ app or call Public Works, (949) 248-3554 or email publicworks@danapoint.org. Please report any suspicious activity to the Orange County Sheriff’s Department by calling Sheriff Dispatch at (949) 770-6011.